This morning, I dropped Sam off at his friend's house for the morning. He has been friends with this sweet girl since they were about one and a half years old. Since that time they have had almost weekly play dates together, going back and forth between our two houses. She is homeschooled as well, so even during the school year, we still arrange visits. Sam considers her his best friend (after Sadie, he says). Sadie and I came back to the house. 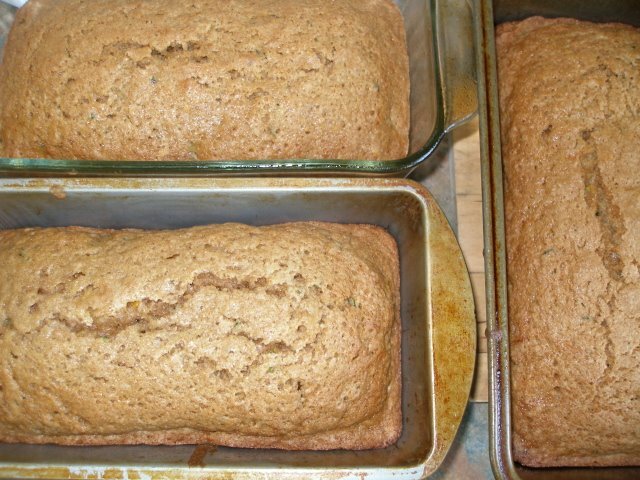 While she played in the sink (her favorite activity, just ahead of playing on the swings), I made another batch of zucchini bread (12 loaves). This is a great way to use up all the zucchini that seems to float about this time of year. It freezes really well and is a cinch to defrost (2 minutes, unwrapped in my microwave). It pairs perfectly with fall and winter soups. If you don't grow zucchini yourself, I bet you'll come across someone who is giving the stuff away. Or, head down to your farmer's market and pick up a few. Last year, all our zucchini plants got eaten by some kind of borer. I bought large, beautiful zucchini at our farmer's market for only 25 cents each. Another thing I do with zucchini (which is way easier than making bread) is to chop it up into bite-size pieces and throw it into ziploc bags for the freezer. It's all ready to be tossed into soups and casseroles straight from the freezer. Healthier Variations: You can easily cut back on the sugar a bit. You can also substitute a 1/2 cup applesauce for 1/2 cup of oil. Would you like zero oil? If so, you can substitute 1 cup cooked pureed pumpkin for the oil (as celebrated here). Zucchini-Blueberry Variation: To put it over the top, fold in two cups fresh or frozen blueberries at the end of the recipe. Zucchini-Chocolate Chip Variation: Fold in two cups of semi-sweet chocolate chips at the end of the recipe. Chocolate Zucchini Variation: Substitute 3/4 cup cocoa for 1/2 cup of the white flour. Combine wet ingredients in a bowl. In another bowl, combine dry ingredients. SIFT the dry into the wet and stir until well mixed. Divide into 2 greased loaf pans (9x5x3) and bake at 350 degrees for and hour (or until a knife inserted in the center comes out clean). Cool completely on racks, remove and wrap in plastic wrap and then foil if freezing. I hate sifting, but it is a must in this recipe, otherwise you will get clumps of flour in your loaves. As far as cucumbers go, we make the cucumber salad (in my A Good Thing Going post's comments is the recipe) or tabouli or we eat them raw dipped in salad dressing or salt. Yet another succes from recipes I've gotten from you. My husband didn't even want to try bread with zuchini in it HA. He loved it, too. (Blueberries were a great addition. This is baking right now. Smells great! I made 4 loaves last friday and I am planning on making 6 loaves this friday! I love is recipe! I prefer the blueberries, in the bread, and I am going to try strawberries. Thanks for all the great recipes.